Millions of people suffer from acne at all ages. Sadly, much like that of Barbara’s story and her journey below, many of us wander around the Internet in a tiresome effort to find a solution. This search can often lead to frustration, despair, and even depression, all the while wasting hundreds or thousands of dollars on products with empty promises and homeopathic solutions that simply do not deliver. Read below find out how ZENMED’s Acne Line was the dream solution for one woman’s 10-year struggle with severe acne. My struggle with acne started when I was 20 years old. It is my belief that this was due to me moving to a new country with weather which was quite possibly the wrong climate for my skin type. I’ve tried using products like Proactiv, but it didn’t treat the problem. I have spent endless amounts of time searching the Internet for home remedies. I’ve created concoctions like baking soda, lemon, and honey. You name it, I’ve tried it. I was hoping these more natural approaches to acne would work but had no success. Then I went to see a dermatologist and they prescribed Accutane. I didn’t know what the side effects of Accutane would be, but after six months of my one-year prescription with little to no success, I searched the Internet for reviews of this drug. After reading the many scary and negative side effects this drug has, I immediately stopped using it. I then started to use another treatment with benzoyl peroxide, but I came to know that I am allergic to it. After years of searching the internet, fate brought me to ZENMED’S website. At first, I was hesitant because so far nothing seemed to work, but what the heck, I’ve tried almost everything so why not give this one a chance? 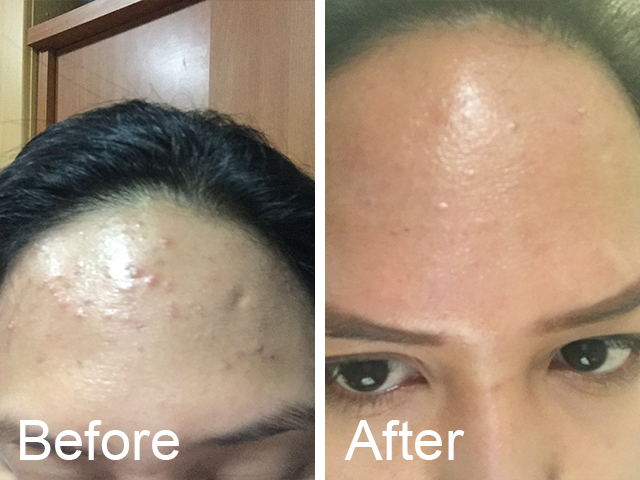 After two months of using ZENMED’S Acne Line, I realized that it was the best decision I’ve made for my skin. You can see in my pictures that it’s not 100% perfect yet, but for the past 10 years, my face has never been this clear! I will start using the Skin Eraser Kit next to get rid of the scars and move on from that horrible 10 years of my life! While everyone’s story is unique in some way, the struggle of eliminating or greatly reducing acne remains similar. We all spend too much time and money searching for the ideal solution that we hope are going to give our lives back. Perhaps ZENMED is that miracle solution that will work for you just like it has for Barbara and thousands of others. Why not give it a try? We have a 100% money back guarantee, so really, it is a win-win to take the chance on something new. It was an inspiring article. Though her struggle was real, she ended up a happy ending story. When I was in high school, I also suffered from acne and I have now this acne scarring. I will consider try ZenMed and try my luck. I hope I will end having a clearer skin too. Thanks! We are so glad that this article inspired you and also helped you find ZENMED skincare. The best option for you would be our Skin Eraser Kit. The most common complaint of post-Acne discoloration is often heard after a breakout. This triple-acid, esthetician strength, Hydroquinone serum assists in diminishing imperfections on the surface of the skin. Suitable for all skin types prone to scarring and those with wrinkles and fine lines. Here is a link to where you can purchase it https://zenmed.com/scars/. Thank you for your feedback and we are excited to see your results. Thanks for the info! acne are generally harmless but they can irritate you. Choosing a wrong treatment can be a cause of scar or skin infection. So it’s better to get rid of them using secure methods.